Location: Around 13 km (8.08 miles) from Tiananmen Square, south of downtown Beijing, Nanyuan Airport is situated in the Fengtai District, and is closer to downtown than the Capital International Airport. Brief Intro: It is a relatively small when compared with other Chinese airports. First constructed during the Sino-Japanese War, it became an important military airfield upon the founding of the People's Republic of China. In 2007, the first reconstruction of the airport was finished and the airport was put into civil use the same year. On July 6th, 2012, the newly built terminal was open to the public formally, which increases the airport capacity for handling 6 million passengers annually, while there is still capacity for further growth. Currently, China United Airlines is the only commercial airline using Nanyuan Airport. It offers flights to more than 50 domestic cities, such as Guangzhou, Xi'an, Sanya, Hangzhou, Chengdu, Changsha, Chongqing, Wuxi, Dalian, Hohhot, Harbin, Changchun, Lanzhou, Yinchuan, Lianyungang, Zhangjiajie, Shenyang, Foshan, Fuzhou, Jiamusi and Urumqi. Currently, there are two terminal buildings at Nanyuan Airport, the old terminal, and the newly terminal. In total they cover an area of about 20,000 square meters (4.9 acre). There are 3 baggage turntables and 10 security channels in the airport now, which can fulfill the needs of 4 to 5 flights taking off at the same time. The check-in counters increase to 13, while the self-service check-in counters will be set up in the near future. The area of the waiting zone has been expanded to 600 square meters (0.14 acre), and 12 boarding gates are arranged there. In addition, after the reconstruction of the apron, this airport can accommodate about 25 United Airlines planes (mainly Boeing 737 aircraft). The new car park will have over 600 parking lots. Bus no.501 runs between Caoqiao and Nanyuan Airport. Passengers can board the bus at the airport terminal for a fare of CNY1. It takes about 10 minutes to get to Sanyingmen where passengers can change to a Speed Line 1 or 729 reaching Qianmen in 25 minutes. It operates from 06:00 to 22:00. The bus stop at this airport is called Xinhua Lu Nankou (south end of Xinhua Lu). In addition to the bus 501, there are more buses 610, 369, 353, 953, Yuntong 115 and Mini Bus 13, 62 for passenger to choose. The operating hours of these buses is from 5:00 to 21:35. Sanyingmen Station which is two stops away from the Xinhualu Nankou is a better transfer station, for there are more bus routes, such as buses no. 742, 729, 324, 366, 610, 627, 736, 526, 927, 954, 501, 504, and 997. Among them, buses no. 742 and 729 run straightforward to Qianmen. The following is an indication of taxi fares from this airport to important places in the city center, for your reference. How to get to Capital International Airport? 1. By bus: Take the shuttle bus to Xidan Aviation Building and transfer to the shuttle bus line 2 of Capital Airport directly. The whole trip takes around 2.5 hours and the total cost is CNY40. 2. By bus + subway: Take the shuttle bus to Xidan. Walk to Xidan subway station to take line 1 to Jianguomen, and then transfer to line 2 and get off at Dongzhimen. 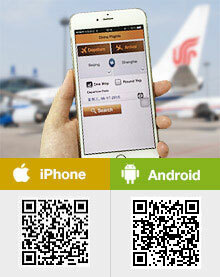 There you can transfer to Airport Express Train to Capital Airport directly. For the whole trip, the cost is CNY29 (CNY4 for subway) and the travel time is around 2 hours. 3. By taxi: It takes around an hour and costs CNY120-150. Passengers can book air tickets at the ticket counter, or on the website of China United Airlines. Apart from the above two ways, passengers can also book their ticket at the air ticket windows in Beijing City. Address: Counter 21 on the second floor of ticket office. Discounted tickets: Compared with Capital International Airport, Nanyuan Airport offers passengers more cut-price tickets. However, these discounted tickets are typically for places that are not among the more conventional tourist destinations, so they are most likely to appeal to the more adventurous traveler. As it is not possible to buy discounted tickets in advance, they have to be purchased upon your arrival at the airport. Boarding: There is no need to arrive at the airport more than an hour prior to your flight departure since the boarding procedure is less complex than at other airports due to there being fewer passengers. The ticketing window, check-in counter and security channel are near to each other in the terminal, which make it convenient for passengers to board their flights. Generally, passengers are taken directly to the terminal building by the airport bus or taxi. However, those using the public bus will have to walk from the bus stop to the terminal building. This will take approximately 15 minutes. It has been built since 2014 and will be put into use in 2019. What is the nearest metro station to Beijing Nanyuan airport? The nearest one is Wufutang Station on subway line 8. The distance is around 2.5km. You are asking the way from Nanyuan Airport to Capital Airport? If so, you can take Shuttle Bus Line 15 directly to the capital airport. BTW, it takes about 1h 50 minutes and CNY100.